If you’re flying to Europe in Business Class you can enjoy express dine meal in evening flights. Other beverages like Wines, liqueurs, desserts, fruits, cheeses and coffee can be enjoyed in Business class. If you’re traveling to Japan for a meeting or vacation, you can enjoy the traditional Japanese meal. Menu is designed by world-renowned chef Charlie Trotter. Other entertainment facilities available to business class passengers are nine video channels featuring seven movie and two short subject channels. To avoid noise pollution, noise reducing headsets are provided to passengers. Passengers can enjoy audio programs also. Certain premium services are provided in flights between New York (JFK) and Los Angeles or San Francisco. 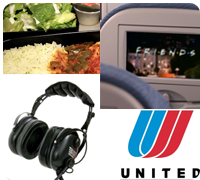 These premium services include – Noise reduction headsets, Personal Media Players and exceptional meal facility. 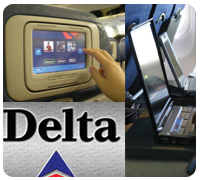 Delta Airlines have named Business Class as Business Elite. Business class passengers traveling in Business Club can enjoy comfortable, relaxed and productive in-flight experience. When traveling in Intercontinental Business Elite passengers can enjoy Flat bed seats which has full size pillow and quilted duvet comforter. Entertainment facilities provided are it has as library of 250 movies, 100 TV programs, 50 hours of HBO, Video games and kid friendly programs. In transcontinental flights (New York (JFK) and Los Angeles or San Francisco) Business Elite passengers can enjoy cradle seats which has premium pillow and duvets, PC power and USB ports at every seat, Internet access facility, Personal in-seat Panasonic audio/video facility etc. International five course dining menu is designed by celebrity chef Michelle Bernstein. Menu of Business Elite is determined on two factors: season and whether you’re flying to or from U.S. Special meals are also available on all flights. Passengers of BusinessElite can enjoy seating facility as it provides multitude facilities like new bedding with full size pillow and duvet, PC power at every seat, gourmet food and wine pairings. On certain international flights flat bed seating facility is provided to passengers. If you’re waiting for your flight, you can use Delta sky club before your trip. In this club you are provided certain services like complimentary drinks, local telephone service, newspapers and magazines and television. Business class passengers can have a nice time on board. Passengers can entertain themselves by watching movies, TV and audio channels, playing games or reading British airways in-flight magazine. 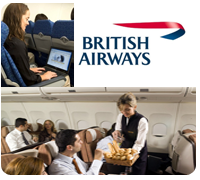 High life, Business Life and First Life are some of the in flight magazines of British Airways which has entertainment listings available in the flight and some unexpected business travel airline ideas travel, lifestyle features. You can do shopping on board, from fragrances to watches all at great value prices. You can enjoy your meal, which is offered free of charge on all flights. Special and medical meals are available to those with particular dietary needs.